The first sweet pea bloom of the season. All I know about plants, I learned from the sweet peas (sort of). Some plants appreciate a little attention when they are starting out, but once they’ve established themselves, they like to be left alone. Sweet peas appreciate it if you soak their seeds a bit before you sow them, but after that they don't need any extra attention. Many plants go through an awkward stage in the beginning, but they grow out of it. The sweet pea vines always look like they are struggling when they first germinate and are a few inches tall, but they soon grow out of it. No plant blooms forever. 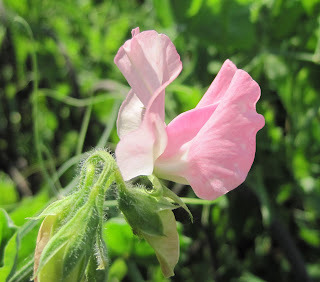 The sweet pea blooms are ever so sweet, in scent and looks, because they only bloom for a short while. Mine started blooming on May 29th and if the weather holds out with good amounts of rain and normal, not too hot, temperatures, they should bloom for about a month. Some plants aren’t intended to grow for the entire season. Much as you might coddle a sweet pea vine, once it gets hot, it will start to dry up and die off. Every plant has its season. The sweet pea blooms at the end of springtime in my garden. We can’t rush the seasons, nor can we stop them from passing. May becomes June, the sweet peas bloom, and the garden begins the season of summertime. All I know about plants, I learned from my humble, sweet smelling, sweet peas (sort of). How different our gardens are that you see sweet peas as a hot weather plant in the transition of spring to summer. My sweet peas begin to fade as soon as the temperatures hit the 80s which knocks them out usually by April. I associate them with early spring, with redbuds and species tulips. I've had sweet peas as late as June...but only stragglers, and only in a wet, cool year. Swwet peas are my favorite flower. They remind me of youth and playing in the moutains with my brothers. I do not have any luck with getting them to grow in hot clay soil of North Carolina. I do miss them and lilacs.... I miss lilacs. So far, Carol, my sweet peas have taught me that every year in Austin is too different to learn a dang thing! Seems like the same action 3 times in a row gets 3 different results. This morning the 'Royal Wedding' sweet peas still have fragrant flowers and buds- can't believe they'll last much longer with another week in the 90's...enjoy yours! I would love to grow sweet peas, but it gets too hot too fast here. Also, they are European plants, which means that they would need more attention here than just a soak and sow. All I know about plants, I learned the hard way—from trying to grow plants like these here, and discovering it's not tenable. I failed to plant sweet peas last November so two plants volunteered themselves along the Stick House. Did the sweet peas tell you that they like to be deadheaded? They'll bloom a teeny bit longer if they are not allowed to set seed. Of course if you want seed, let a plant or two go ahead and make peas.